We arrived back in Santiago from Easter Island, our second stop in the city. Our last visit had been an airport stopover for one night so we were keen to make the most of the two days we had and explore some of the main sights. 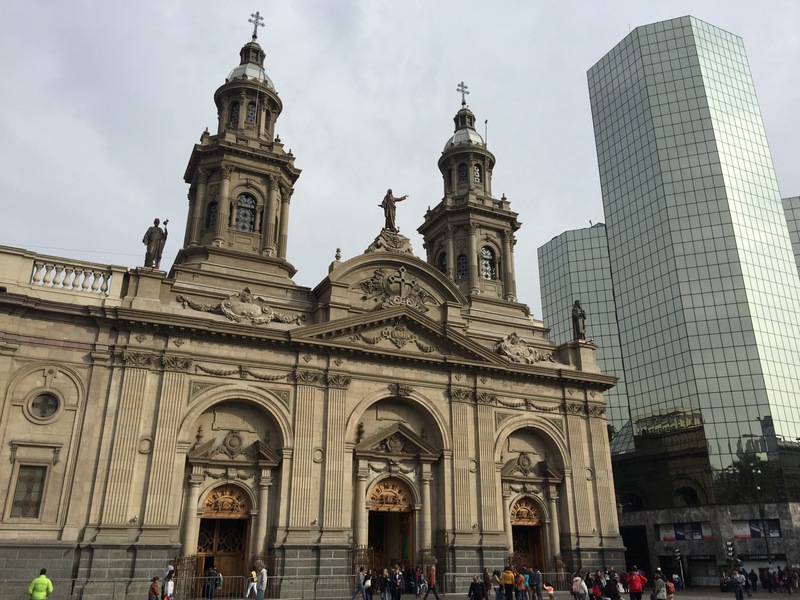 Fortunately all the major attractions are within walking distance which allowed us to plan an itinerary for the top things to see in Santiago in a day. Our hotel apartment was conveniently located in the middle of town, a $10 drama free shuttle ride from the airport this time! The main confusion came in working out which of the five towers of the complex it was in – but after several failed attempts to find the 13th floor we arrived and checked in. After a patchy nights sleep we set out on our planned route for a one day in Santiago tour, starting at Santa Lucia Hill which was only a few hundred yards from our hotel. 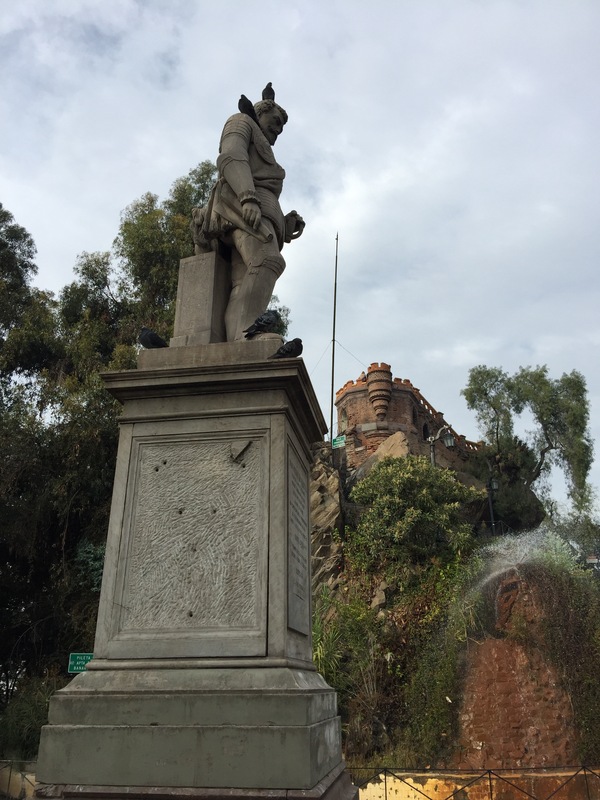 Santa Lucia is a small hill in the centre of town ordained with ornate facades and a number of statues, fountains and monuments and the famed Castillo Hidalgo. From the top of the hill you get a great view of the city and surrounding mountains. Entrance is free and the gates were open from early in the morning. From Santa Lucia we headed to the Plaza de Armas de Santiago, a large European style plaza with vast numbers of wooden benches which even at 12 midday on a Tuesday all seemed full – mainly with the homeless and the elderly. While we never felt unsafe, the number of homeless people washing and shaving in the fountain or sat around drinking their breakfast from a paper bag was sad to see. We hadn’t had a chance to eat the night before, so after some quick photos around the plaza we headed to the furthest corner to the Metropolitan Cathedral (Catedral Metropolitana). The vast orange building with chandeliers and frescos is an architectural gem. After plenty of photos around the Plaza we stopped to enjoy some pizza and a bottle of wine and did some people watching. Former National Congress Building and Supreme Court. 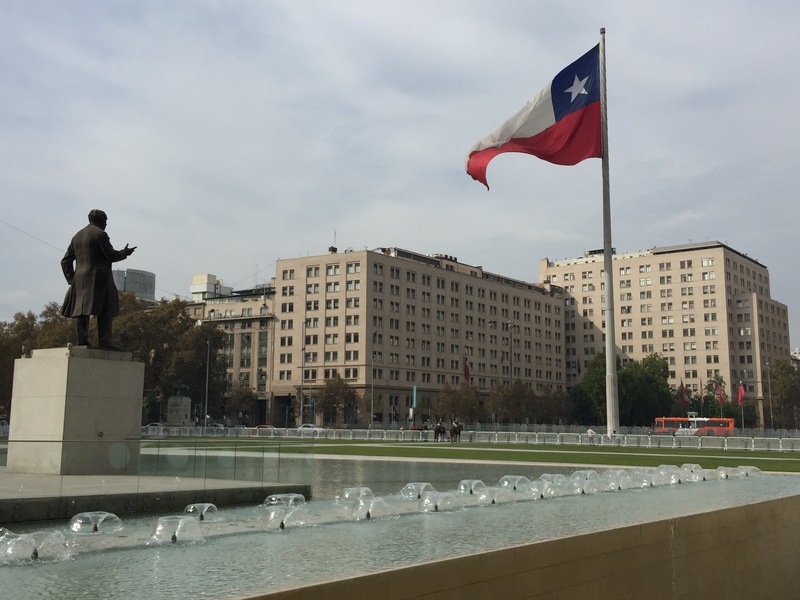 Once fed and watered we head just around the corner from the Plaza Aramas to the Former National Congress Building, the current building was completed in 1901 and was the home of the Chilean Congress until the Pinochet coup in 1973. 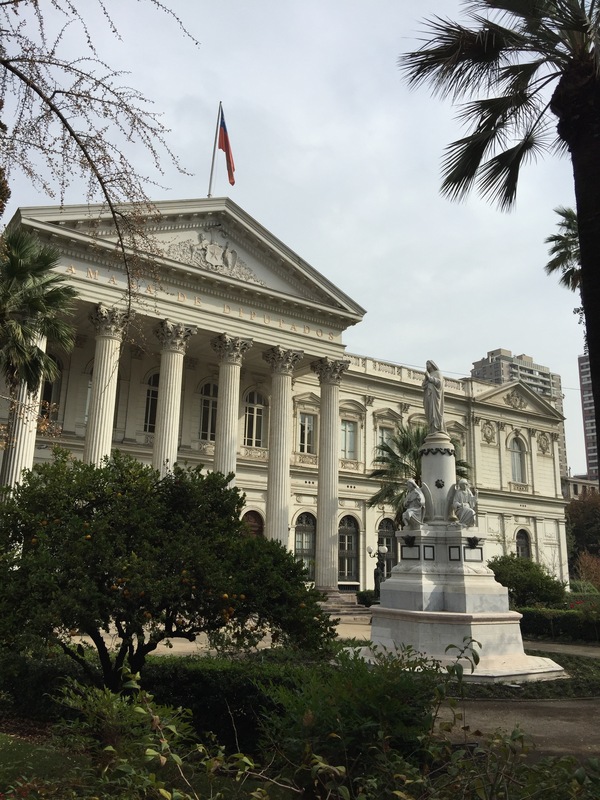 Alongside it you’ll find the Palacio de los Tribunales de Justica de Santiago and other architectural gems. Next we headed on to La Moneda Palace which was originally the national mint but now houses the presidential offices. 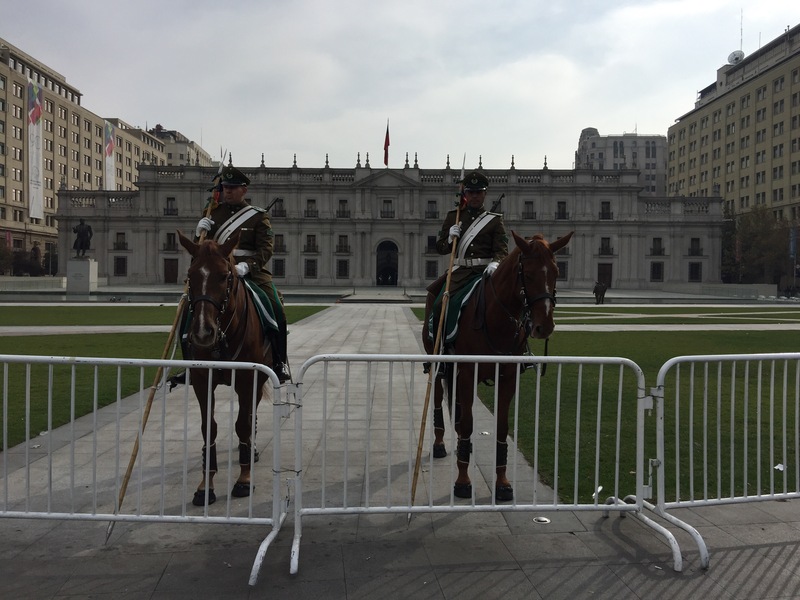 The impressive building and large gardens feature a giant Chilean flag and soldiers on horseback with lances at the gate – always a great photo op. After an afternoon nap we decided to go out for a few drinks, unfortunately almost everything in Santiago was closed by 9pm. With options dwindling we stumbled upon a bar where picked some tapas dishes and local Royal Guard beers. What started as a plan for a quick drink and bite to eat ended in several rounds of beers and lots of ‘bar snacks’ of melted mozzarella sticks and pork bites. With the major attractions ticked off the previous day we opted for a lay in before heading to the airport for our midday flight to Rio. Randomly the pics didn’t show up on website only on email.